A healthy take on the old favourite, San Choy Bau. When you are trying to eat more nutritious foods, it does not mean you have to miss out on tasty dishes! Forget the pre-made sauces that are laden with sugars, fillers and god knows what else. The secret is to make it as easy as possible and start to taste real fresh foods and fresher flavours!! This meal is so simple, I mean seriously simple. Great for a mid week dish that you don’t need to think about. I’m not kidding 15 mins to get everything sorted, BOOM! You can even cook a double batch and freeze left overs for lunch! Heat coconut oil & in a large frying pan on a med heat. Add the chopped celery, garlic oil, chilli and a tsp of salt, sauté until golden. Add the chicken mince, tamari and chilli and sauté until brown and well-cooked. Set aside. In another small bowl, smash the avocado and sprinkle sesame seeds. Set aside. Cut off the stem of the lettuce carefully pulling each lettuce leaf/cup away from the head of lettuce. 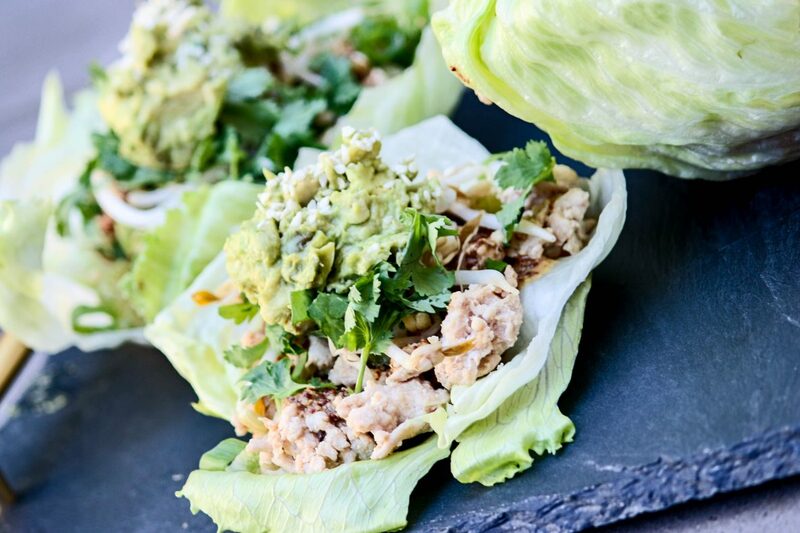 Set aside and repeat until you have 5-6 lettuce cups. Dressing, add the mustard, tamari, sesame oil, spring onions and water to a small bowl and whisk. To serve, add the chicken mince to each lettuce cup and top with all the dressings, parsley, coriander, spring onion and dressing. Enjoy your San Choy WOW! !